THAT DONEGAL ACHIEVED promotion from Division 2 without the talents of key forward Paddy McBrearty bodes well for the championship. The reigning Ulster champions were boosted by the returns of Michael Murphy and Leo McLoone from injury mid-way through the campaign, while the Gaoith Dobhair contingent have also strengthened the panel. Frank McGlynn made his comeback in Sunday’s win over Kildare and McBrearty is nearing a return to full training, with Odhran MacNiallais expected to rejoin the squad prior in the coming weeks. “Paddy has been back running and back training,” says defender Stephen McMenamin. Paddy knows himself that if he’s not right, he won’t be risking it. Paddy will be a massive addition to the Donegal team whenever we get him back. “I’d say last week and this week he’s easing himself in, he’s not going to go full tear at anything. I’d say he’s going to step into drills, step out of drills, he’s going to pace himself, he’s not going to rush into anything. 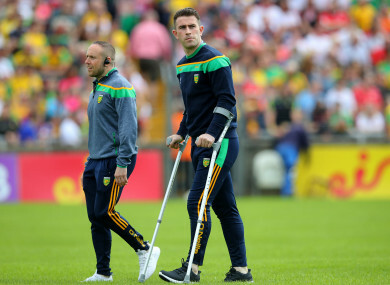 McBrearty, one of the few survivers from the 2012 All-Ireland win, suffered the devastating torn cruciate last June. He’ll rejoin a team high on confidence after they won three games on the trot to seal an immediate return to Division 1. McMenamin broke onto the starting team last year during his rookie campaign and has been a regular in the full-back line in 2019. He hailed the impact of Murphy, who made it back from a knee injury to drive Donegal towards promotion. “Even getting the likes of Michael back there in the last few weeks, Frank (McGlynn) training is always improving and that’s how we improve in a team. Michael is always pushing you. He is always looking to get the best out of everyone. Not that he’s not always happy but he always can see that we need improvement. “I think that’s what drives everyone on. He’s a real leader. If something isn’t going right, he’s guaranteed to be the man pointed out. If you are ever looking for anything, you are probably going to Michael and ask him and he’s going to have the answer for you. A Division 2 trophy is at stake against Meath on Saturday, but McMenamin believes they’re capable of lifting the big one at Croke Park later in the year. “At the moment, yes I do,” he said when asked if he thinks they can win the All-Ireland this season. “The strength and depth we have in the team, no man’s place in the team is secure. Compared to other years where you sort of knew the team but this year you’re looking over your shoulder and nobody is safe at the minute. “There could be 10 or 11 backs there at the minute who will feel like they should be starting so it’s not easy. “To be fair, you see the likes of Tyrone, Monaghan, Ulster is not going to be easy. You have to be performing at the same level as you’re going to be performing on All Ireland and the Super 8s. So you need to be at an extreme level to beat the likes of Tyrone because they’re always performing well. At the end of the day, our main aim is to get to an All Ireland final, win an All Ireland but Ulster will be at the top of our list for the next six to eight weeks. “Every game we go out, we want to win. Even you can see it in the last few games, the atmosphere in the changing rooms after the games is completely different to when you lose. “It’s a bonus to get to an Allianz League final and it’ll be a massive bonus if we win on Saturday. Email “Donegal star nearing return after cruciate injury”. Feedback on “Donegal star nearing return after cruciate injury”.